Here are 3 great stomach exercises from Personal Trainer Sarah Cailler. You'll definitely feel the burn from these stomach tightening exercises. These stomach slimming exercises are not only good ab exercises for women, they are great for men also! These exercises are all advanced exercises, so master the basics and build up to them if you're new to exercising. Starting Position: Begin by sitting with your knees bent and your feet on the floor. Slightly recline your upper body so that there is tension in your stomach muscles. Hold a weighted plate in front of your body. Form: Slowly twist your body to one side and aim to touch the floor with the weight. Pause briefly when you reach the floor and then twist your body to the other side. Personal Trainer Tips: This is an advanced stomach exercise because of the additional resistance. You should begin by mastering the Russian Twist with no added weight. Move in a controlled manner. Repeat 8-15 twists on each side. Starting Position: Begin lying on your back with your legs straight in the air and your hands behind your head. Form: Perform a slight crunch with your upper body. Exhale and slowly lower your legs towards the floor, then slowly return to the starting position. Perform 8-15 repetitions. Personal Training Tips: This is also an advanced stomach exercise. It will really challenge your stomach muscles and your lower back muscles. As you lower your legs, you must be mindful of your lower back position. Only lower your legs as far as you can before you feel your back starting to arch excessively. Your pelvis should remain stable throughout the exercise. Try mastering regular leg raises first before attempting this exercise. Starting Position: Begin by assuming the side plank position. Keep your feet stacked on each other for a greater stability challenge or place one foot on the floor behind the other to be more stable. Lastly, place your top hand behind your head. Form: While keeping your hips, shoulders, and stomach muscles engaged, twist your upper body towards the floor. Hold for a brief second after your complete the crunch and then slowly return to the starting position. Personal Training Tips: This is also an advanced stomach exercise. First, master regular side planks. Make sure that you maintain a straight line with your body throughout the exercise. Perform 8-15 repetitions on each side. 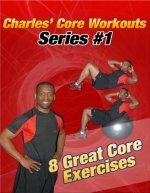 This exercise really challenges core stability, and it is an effective exercise. These are all great stomach exercises, but remember to master the basics first before attempting advanced exercises. If you are new to exercising, visit the Directory of Abdominal Exercises to learn more great stomach exercises and all the abdominal exercises on this site.